Welcome to Mawlynnong or ‘Gods own garden’ reads a simple metal board on the edge of a curve as we drive through serpentine roads of East Khasi hills. All along my drive, beautifully laid brooms made out from a locally grown soft grass and some happy faces carrying this load on their backs can be spotted. Tall trees on the sides, earthy odour, priceless silence, emerald green pastures fringed by Pine trees and nothingness of the landscape; all seemed so fit for an introduction to Mawlynnong billed as the Asia’s cleanest village. On Jake’s instruction (who I met on way from Guwahati to Shillong) I boarded the sumo at Shillong’s Bara Bazaar market and packed myself along with a bunch of smiley khasi folk who immediately took me under their collective wing. A ride of about two hours with a midway halt for tea and Kwai (Meghalaya’s betel leaf) at the village of Pynursla, brought us to a place that looked like a picture of a garden of some fairyland. 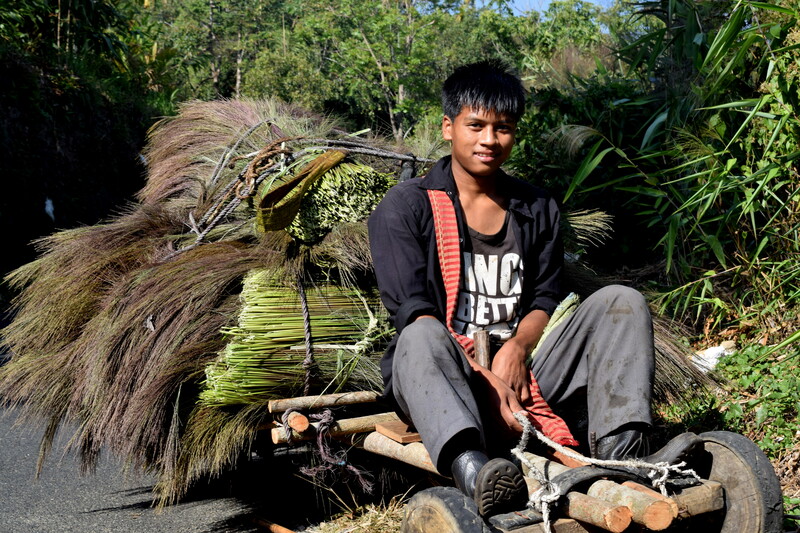 Met this guy on our way, broom making is a major livelihood of the area. Mawlynnong is no doubt, a painter’s canvass, with a beautiful mix of colours, lives and elements. First for an urban bustard like me, who lives and breathes the cacophony of traffic, who yearns to see a clear skyline and who is always in a desperate search of nature’s green basket; Mawlynnong comes as a relief. 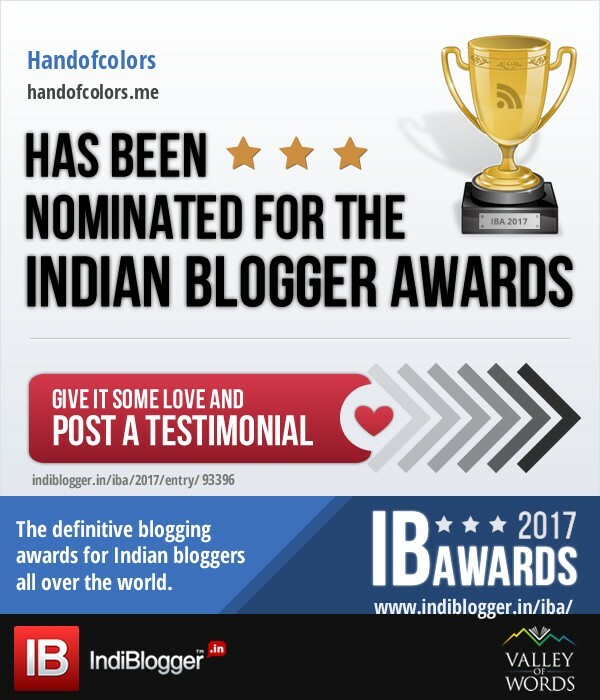 And if you are a conscious citizen of India, who cringes when sees litter around and taking a step forward discourage people from doing so; you will surely feel enthused coming to this place. 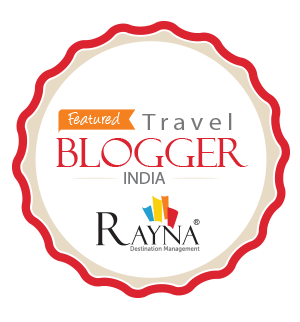 Mawlynnong has indeed earned an accolade guaranteed to inspire. Cobbled streets bordered by manicured lawns and gardens leading upto typical khasi bamboo stilt houses with riotous flowers blooming in the gardens, bamboo dustbins never too far to reach, soothing ambience of a photogenic green hideouts and curious faces giving a hospitable smile, posing for photographs and occasionally yelling out ‘Good Morning’ ensure a once-in-a-lifetime experience for every traveler. And add to it the fantasy of living in a tree-house. 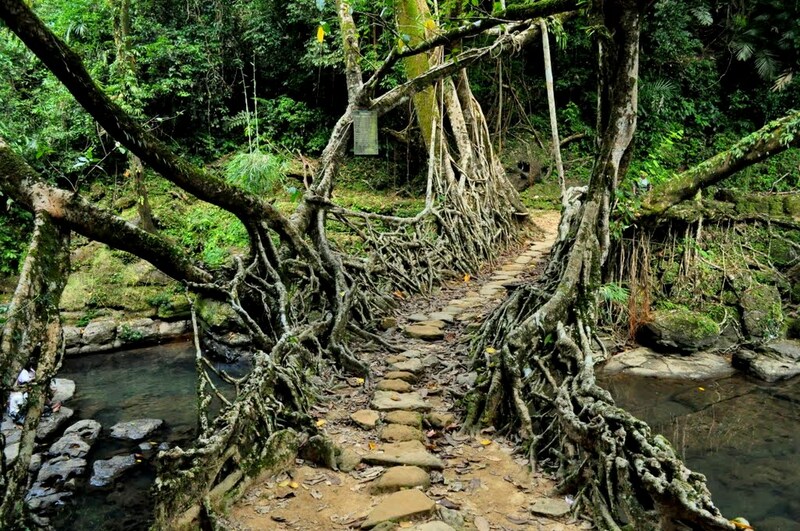 Living Root bridges of Mawlynnong. First on my list in Mawlynnong was the sky view.this is a viewing platform built on the branches of the highest tree in the village. To add, no nails are used in building this 60 feet high platform. The sky view offers a surreal experience of looking down at the canopy of Meghalaya’s forests merging with the plains of Bangladesh. It has been constructed by building a bamboo bridge, connecting upto five trees, sloping upwards; interestingly all the bridges and even the ladders are all tied with bamboo fibres. And as you ascend through the precarious bridges and ladders to reach the platform, a feeling packed with adrenaline sets in, above the trees, overlooking the borders of two countries merge, and standing on a platform that seems like a seated Aladdin’s magical carpet. A walk of 15 minutes from there, down towards the stream introduces you to another natural marvel, the living root bridges – a feat of bio-engineering where organic bridges were built by locals by intertwining the roots of fig trees, which would not deteriorate with time but will grow stronger. A stone path from the Riwai village, with dense growth of foliage on either side, looking like a perfect set of a magical forest in a fantasy movie, leads you to the root bridges. This path is called the King’s way and helped the khasis village helped each other to maintain trade relations. With sinuous turns and sharp inclines, it’s quite a walk to remember. I was told that in the monsoons, the river becomes furious and crossing it for trade used to become impossible. Thus, to build a bridge, secondary roots from the hollow trunks of the trees were extended to reach the other side; once they got entrenched, they were interwoven and then supported by vines and handnails. Some root bridges are hundred of years old, and with their twisted roots, now filled with concrete rocks to look like a constructed bridge, they are any photographer’s objet d’art. From there, I was back to Mawlynnong to have a cup of tea and series of conversation and some more clickable moments. And this time I did gather some strength to try kwai (betel leaf). Over tea, I expressed my wish to learn the story of this small village which has carved a niche for itself on a globetrotter’s map. The village follows a zero litter policy and heavy fines are imposed on anyone littering or destroying forests. Children are taught from the very early age, the value of cleanliness and conservation. But it isn’t that makes it the Asia’s cleanest village – cobbled roads leading to every home, beautiful gardens and manicured lawns, eco-friendly lifestyle, practice of rain-water harvesting religiously followed by every household and mastery over the art of waste disposal that has made the impossible sounding feat possible. 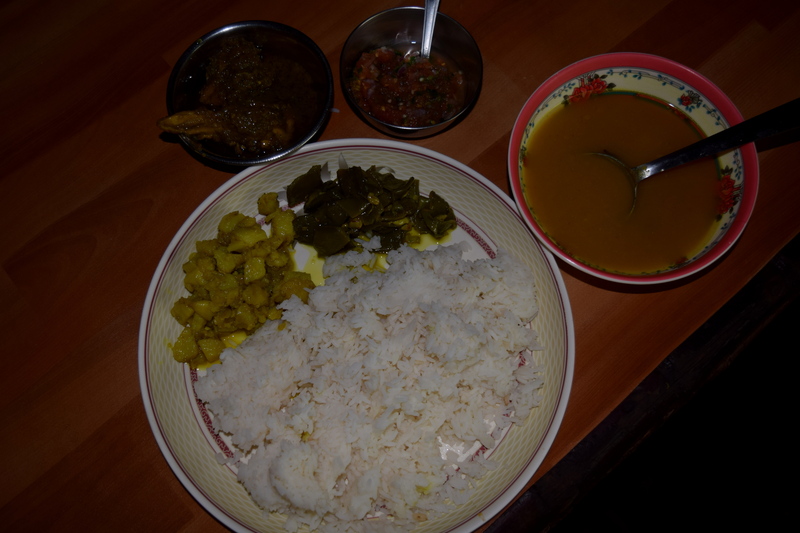 And following my tradition of living local, I had my lunch in a homestay. 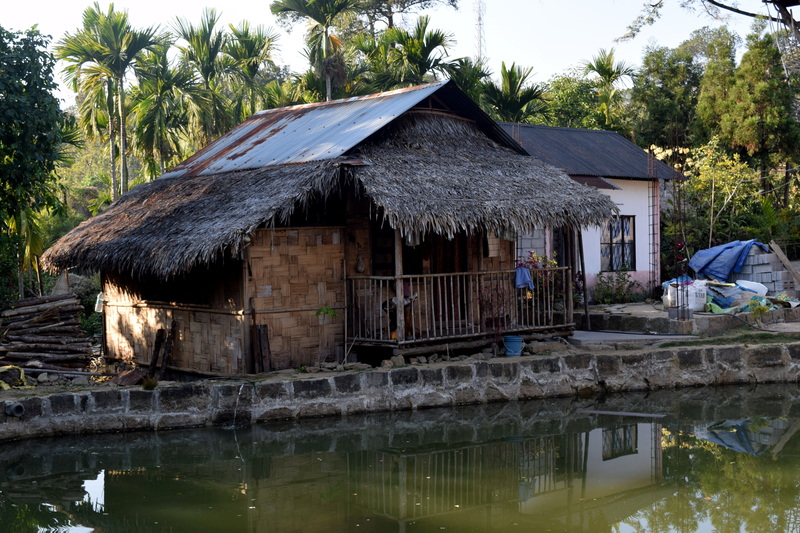 Walking down on Mawlynnong’s roads, looking at the quaint thatched houses, waving hands to the hospitable, enterprising locals, I could feel something inspiring in the air. 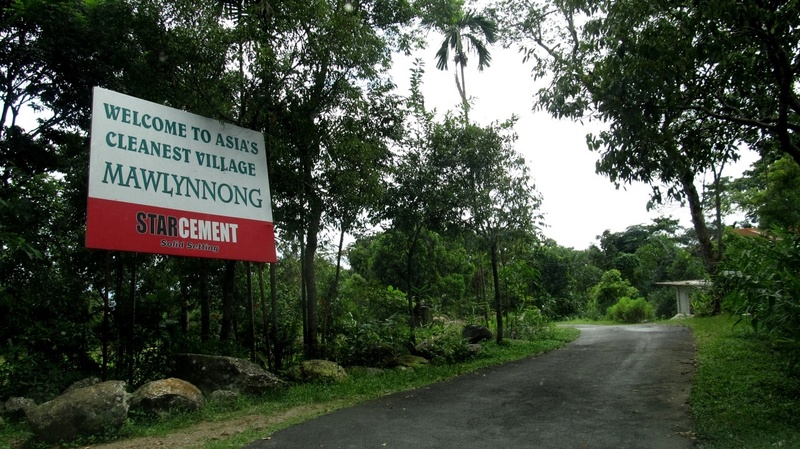 And when our hounourable PM has given a war cry for ‘Clean India’, villages like Mawlynnong are surely a national pride. 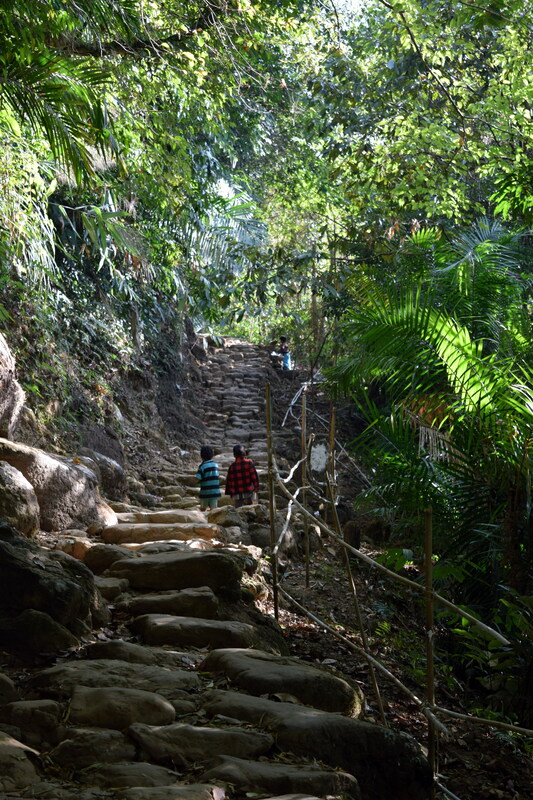 To go – Mawlynnong is 90 Kms from Shillong, Meghalaya. You can take a shared taxi or mini-bus from Bara Bazaar, Shillong. Alternatively we can get a taxi reserved for you from Police Bazaar for something around Rs 2000. To Stay – Mawlynnong has three homestays options and the rates are highly negotiable. You can also book a tree-house for yourself. More than 20 feet high in the air, overlooking a waterfall and a placid lake, this seems a real dreamy house. The tree house has two bedrooms, a living room and a Machan. Machan is a comfortable sit-out option to enjoy windy evening and clear, starry night listening to birds, songs of cicadas, babble of stream or rustle of the leaves above you…or for just simple, short romantic conversation. A treehouse will cost you Rs 2000 for a day. To eat – I have a simple theory, when in Rome, do as the romans do. Eat local, and do try chicken laden with local herbs and spices. The milkless cha (tea) is another to be tried thing.